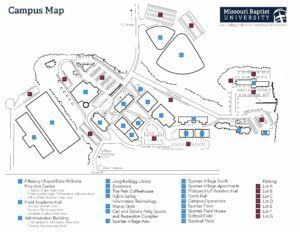 Missouri Baptist University is located north of Highway 40 and half a mile west of Interstate 270 in West St. Louis County. Travel West on Interstate 70 for approximately three miles. Exit onto Interstate 270 South via exit 232 toward Memphis. Take I-270 South to exit 12, I-64/US-40/US-61 West toward Wentzville. Take exit 24 for Mason Road. Veer right onto Mason Road and take the next immediate right onto North Outer 40. Follow the outer road eastbound for approximately 1 mile. Turn left on College Park Drive, just prior to the MBU sign. Take I-270 North or South to exit 12, I-64/US-40/US-61 West toward Wentzville. Take the first exit, number 24, for Mason Road. Take I-64/US-40/US-61 east to exit 24, Mason Road. Exit sign reads “Missouri Baptist University”. Turn left on Mason Road at the stoplight and cross over US-40. Take a right onto North Outer 40 just beyond the overpass. Take I-64/US-40/US-61 west to exit 24, Mason Road. Exit sign reads “Missouri Baptist University”. Take an immediate right on the loop around before Mason Road and continue on North Outer 40 road. The Pillsbury Chapel and Dale Williams Fine Arts Center is the white columned building with a large glass atrium on your left. There is a group of three buildings with a connection walkway. After crossing College Park Drive from the parking lot, the Jung-Kellogg Library sits further back and in the center of the other two. To your left is the Administration Building (visitor information) and to your right is the Field Academic Hall. The Undergraduate Admissions Office and Campus Receptionist are located in the Administration Building. Enter the building on the south side. The door for the Undergraduate Admissions Office will be on your immediate left after entering the building. The Muncy Gymnasium is the fourth building on your right, the first beyond the administration building. 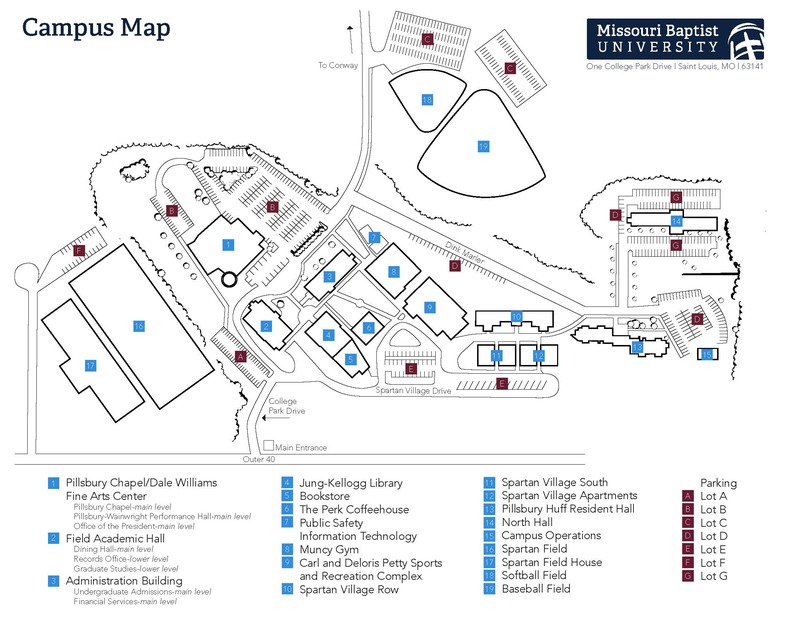 The Residence Halls are located off Dink Marler Lane. Take College Park past the campus buildings and take a right at the first stop sign. Follow Dink Marler for approximately 1/3 mile until you reach a stop sign. On your right is Pillsbury Huff Hall, the men’s and honors dormitory. And on your left is North Hall, the women’s dormitory. The Perk campus coffee house is located in the quad behind the Administration Building.